It’s been very interesting to learn so much more about chickens in such a short amount of time. 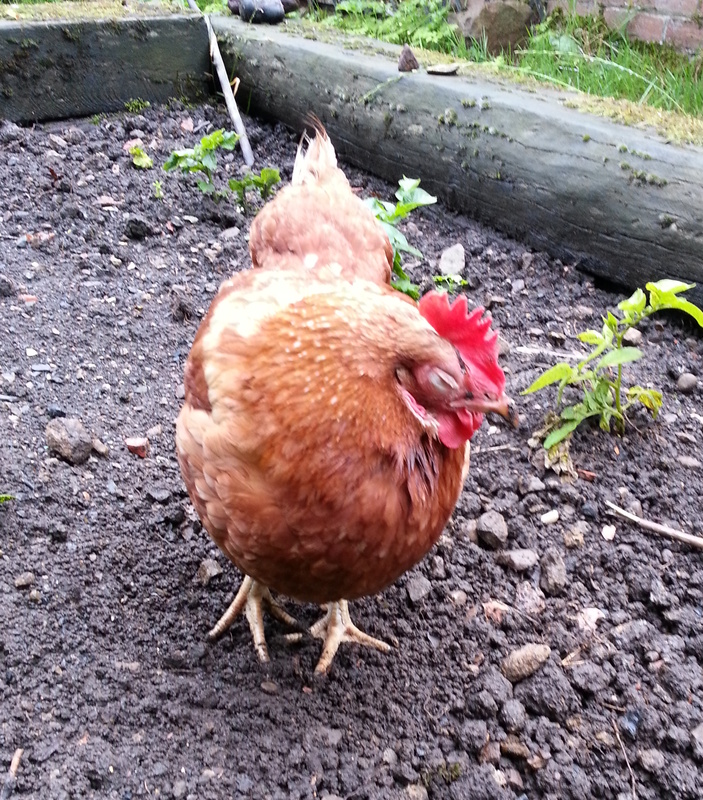 Much of our new understanding of chickens leads on from a decision made when we moved in and found one of the inherited chickens sitting on a clutch of about 6 eggs. We weren’t sure how long she had been there but it seemed a good idea at the time to just keep an eye on things and watch what happens. Sure enough, about 3 weeks later our first ever chicks duly hatched although we really can’t take any of the credit. In fact, there were only two eggs that hatched in the end so perhaps we should take some of the blame for that? They have gone from strength to strength and are now roaming freely with their mother. they are now 6-7 weeks old and we are watching to see when they will head off on their own without her. 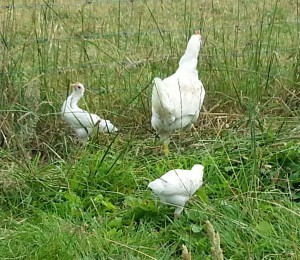 More unexpectedly was the appearance at shutting in time on 1st August of one of the inherited chickens with her healthy looking batch of 7 chicks. There had been no indication of this event and in fact we have been carrying out occasional “egg hunts” to make sure they weren’t off laying in unexpected places. We obviously need to up our game on that front! On consecutive days last weekend we found a dead hen in the main coop (the inherited chickens). In each case, we found a bird just lying on the floor with no obvious signs of injury. Initially this was a little worrying but we are keeping a close eye on them all and hopefully it seems to have just been a coincidence. We are becoming more used to idea of deaths in general, no doubt helped by the assorted wildlife deaths we have come across since moving here – mice in the fields (cats), rabbits on the roads (cars), and birds in various places (cats again). All our other inherited hens and the rooster are looking well and they are still happily roaming the paddocks and woods apparently without a care in the world. Although not technically “dead” our two “pet” hybrids were injured in what appears to have been a fight of some sort. It was probably not a fight between the two of them though as they’ve been together since we got them around 15 months ago. 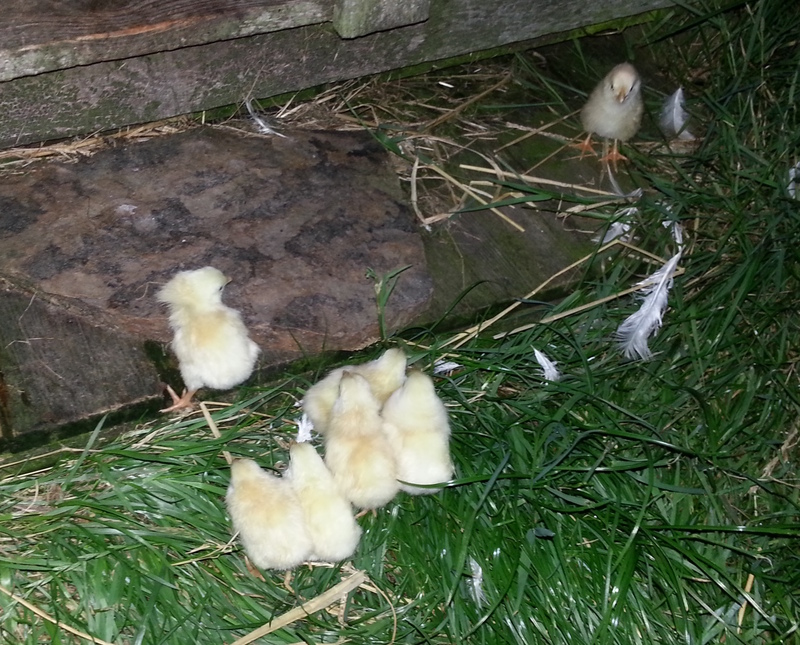 My guess is that it is the result of getting too interested in the newly hatched chicks but I can’t be sure. Because these are our “pet” chickens we eventually (after a day of isolation and observation) decided to take the worst case to the vet for a check over. There was always the outside chance of her having something more serious and the “fight” imply being some bullying of a weakened chicken. Fortunately the check-up found nothing else and involved just a simple injection of an anti-inflammatory along with some anti-biotics to put in her water. I’m deliberately ignoring the fact that the visit to the vets cost 3 times what the hen originally cost – money isn’t everything! After a few days in isolation her condition is improving but we’ll keep her separate until she is completely recovered. Luckily the previous owners had left a home made “broody coop” which we could press into service as a temporary hen shelter. One idea for the future is to eventually house our flock of “laying hens” in a separate, fully enclosed area away from the “inherited” (and more wild) chickens but perhaps that would be an over-reaction to an isolated incident? 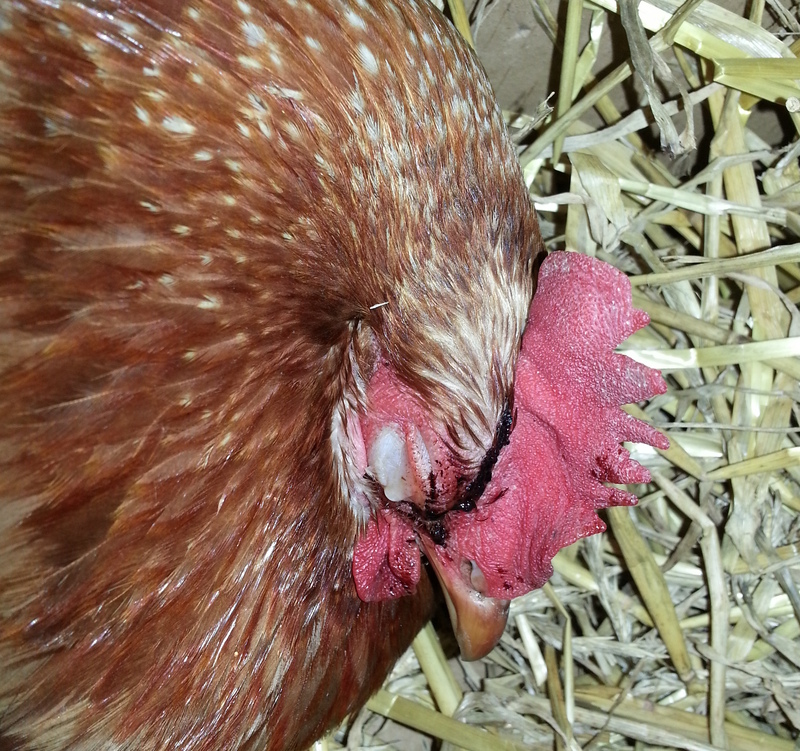 At the same time as the major injury to one hen was spotted, we noticed that our other “pet” hen was also sporting some minor damage. 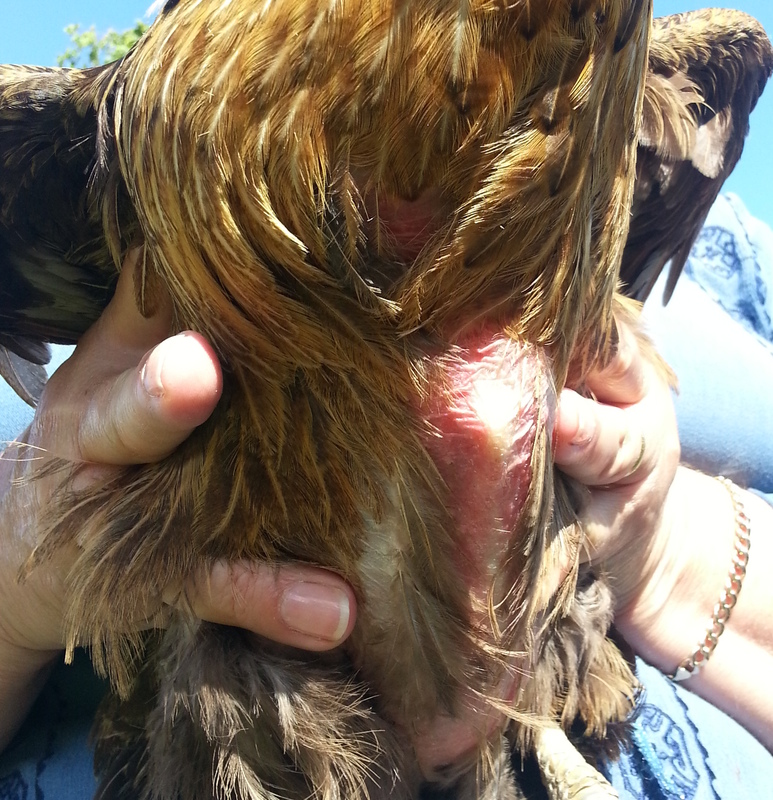 This appeared to much less serious and she was continuing to wander around pecking at everything unaffected by the loss of feathers on her breast but it did look very sore. As expected, she is looking much better lately and she is still apparently oblivious to the loss with a healthy appetite and displays her usual curiosity about everything edible and non-edible. I now have some first hand experience of the efficiency with which a mother hen can defend her young! Also, according to my maths we are still making steady progress overall with a total of 3 chicken deaths being outweighed by a total of 9 chicks hatching in the last month or so. We’re ahead by 6 so far but I’d rather not lose any more and we’ll be more vigilant in future to make sure we do the best we can.